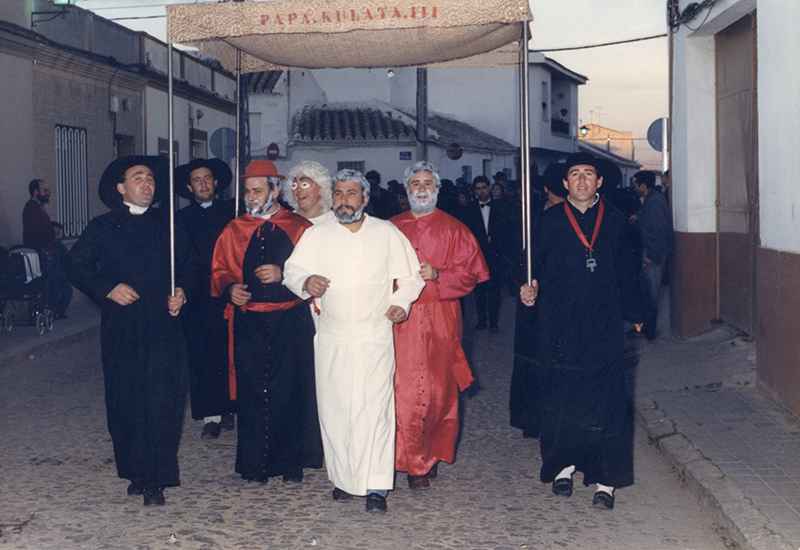 Burial of the sardine, is relatively recent in comparison to the years that is taking place the carnival in Miguelturra. 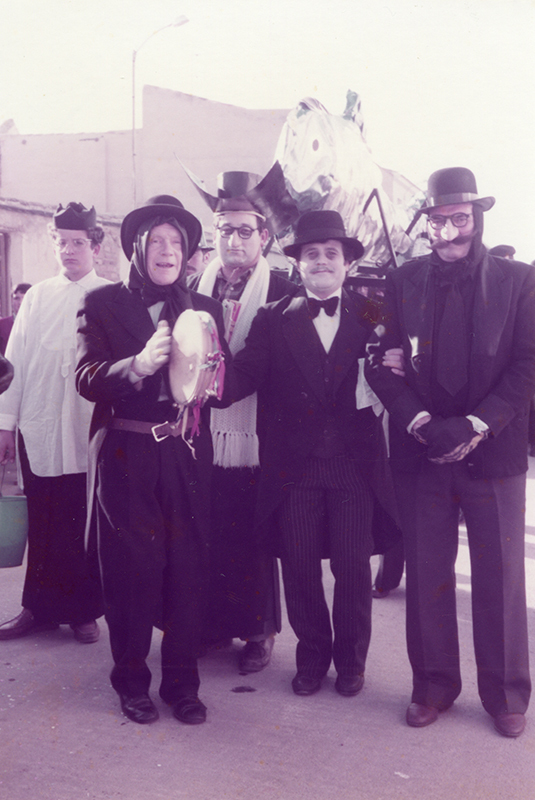 Neither there are documents of its celebration in other localities of the national territory, although there are historians who relate it with the burial of the little pig or piglet, consisting of burying parts of an animal to start the Lent, leaving behind carnival parties as ‘Carnetolendas’, what they were celebrated in the 19th century. In our area, La Mancha, the truth is that there hasn’t been tradition to celebrate the burial of the sardine, much less in times of prohibitions, where parades and concentrations were not authorized, being persecuted to prevent their celebration. 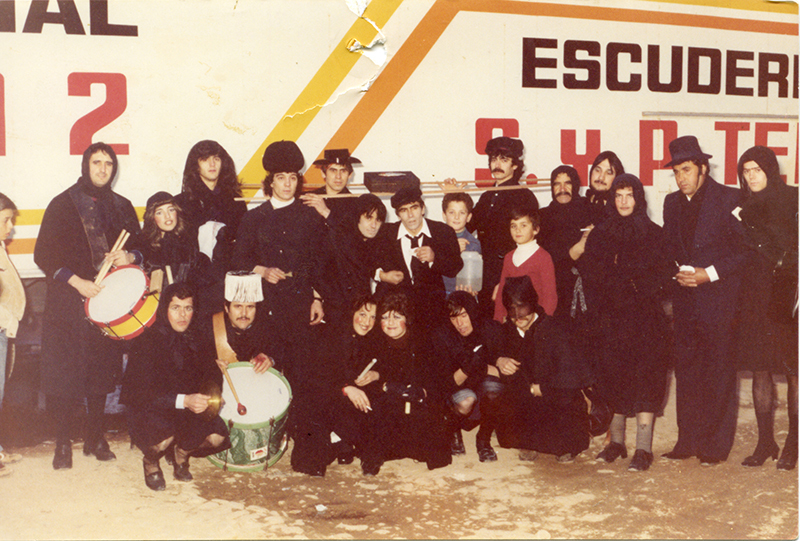 It will be in 1982, when a small group of carnival people mostly belonging to Peña la Cabra, decide to continue with the carnival celebrations in Miguelturra, that Ash Wednesday, they go out to the street and as the King of Carnival tells us, Serafin, “esto se hizo hecho y pensao” that it’s similar to say ‘No sooner said than done‘. A box and two sticks, constitute the funeral box, a fresh sardine is the first deceased. 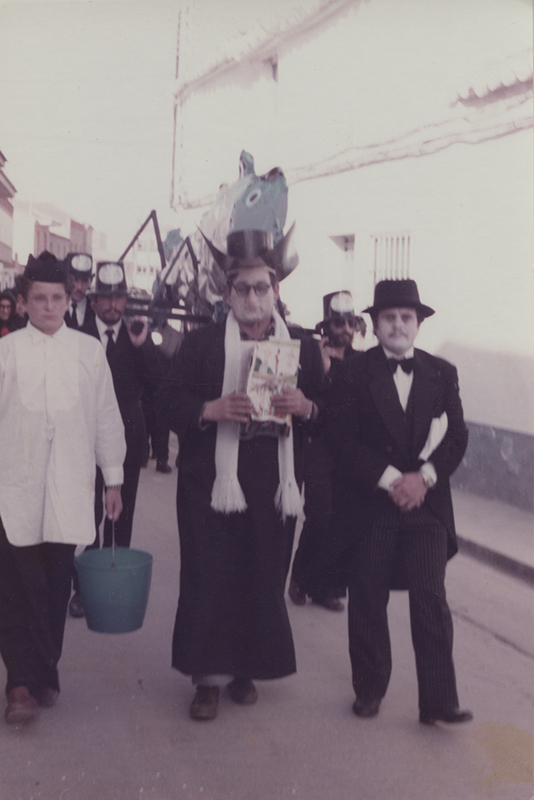 ‘Pepe Pichón’ and ‘Pepe el Lobo’ will carry it to the shoulders, ‘Cruzín’, Paco Molina, Sagrario, Jesús Montera, ‘Calañas’, Miguel, Serafín, Merce, Encarni, Isidro, Pepillo, Venancio, ‘Pancilla’, Sagrario, Pepe Gilda, Loren and Antonio, compose the first funeral parade of the Sardine in Miguelturra. 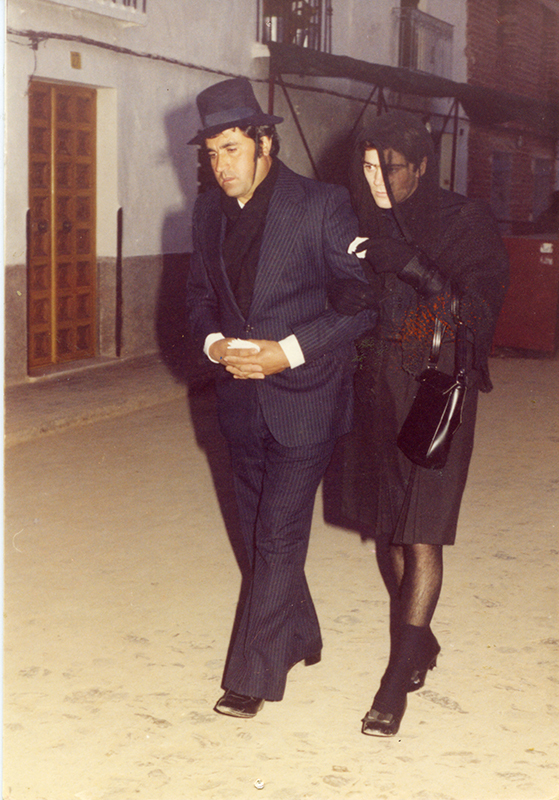 The mourning takes place in the Bar-Restaurant ‘El Ganadero’, from where the procession begins from the centric streets of the town, down the street ‘Toledillo’. 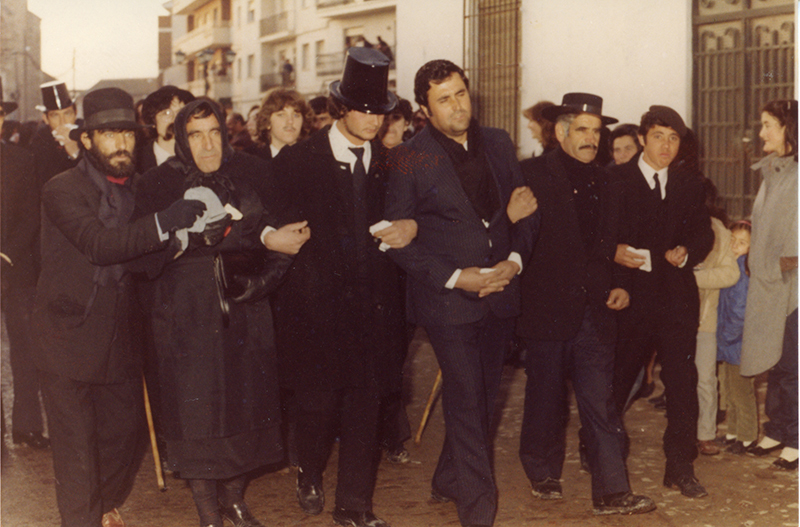 Since that time and respecting tradition, is the starting point of the Burial of the Sardine of the Carnival of Miguelturra. 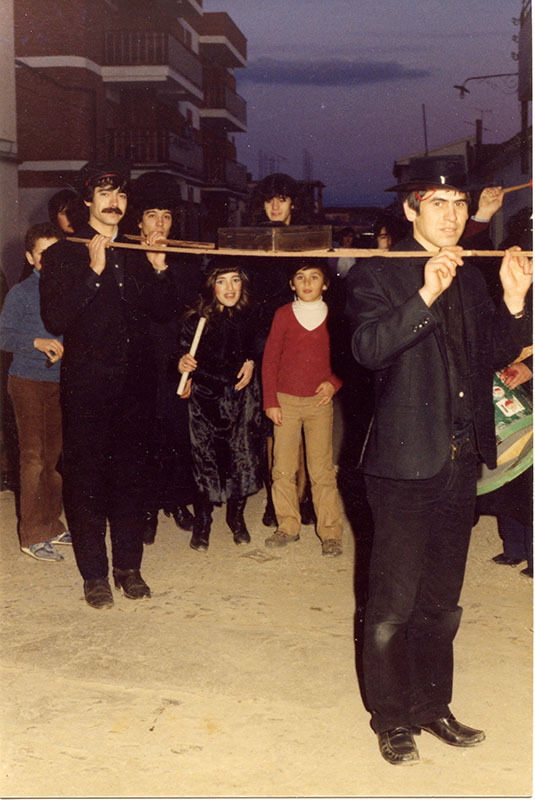 In 1983, It will be included in programs of the Carnival festivities and always organized by ‘Peña La Cabra‘, making a sardine of 6 meters in length, becoming a traditional act belongs to churriego Carnival and being pioneer among carnivals of the area, expanding to the rest of the carnivals of the region. With its inclusion in the Carnival program, the funeral procession, is accompanied by a charanga that gives joy and color to the event, for the enjoyment and uproar of the mourners of the unfortunate sardine. During the years of greater affluence and participation in the funeral, mainly due to the large affluence of curious people from towns where the event was not celebrated, up to three sardines of 6, 4.50 and 3 meters in length were made, accompanied of two charangas. Nowadays, two sardines are made, one of 6 meters and one inflatable of 1.80 meters. The funeral march, runs through the central streets of the town between sorrows and joys, cries, laughter, sobs, some fainting and above all, gibberish. The mourners finish the tour in the traditional crematorium, where both the major and infant sardines will be incinerated. During the cremation of the unfortunate sardines and to recover from the displeasure of such a fatal event, the attendants can taste a good roasted sardines, accompanied by a good glass of lemonade to drown their sorrows. Making sardines takes place at the headquarters of the Peña ‘La Cabra’, during the previous month to the celebration of the Carnival. It is made with about one thousand scales of blue metallised cardboard. 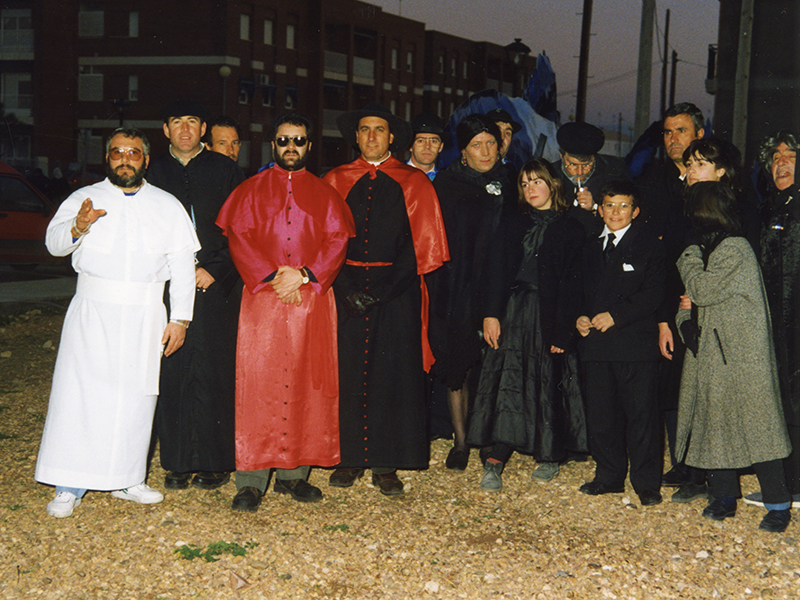 On special occasions such as the 25th anniversary of the foundation of the Association of Peñas or that of this year 2017, because of the realization of the photographic composition on the website carnavaldemiguelturra.es, silver scales are intercalate. Two sardines are made, one of 6 meters and one of 1.80 meters for children. The skeleton is formed by a plywood base, adhered with contact glue, two sponge molds 2 centimeters thick that form the coating, the interior will be filled with several kilos of chopped sponge. 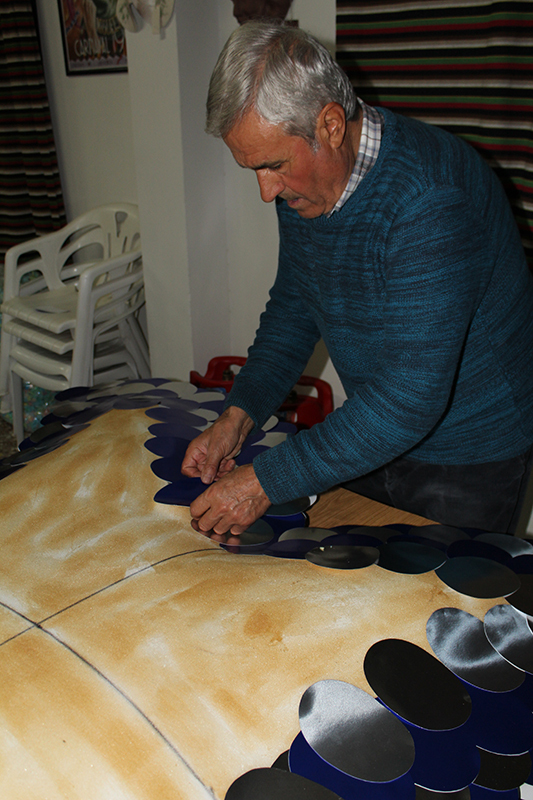 During the process, the components of Peña, cut one by one the scales that will cover the structure. Once the structure takes the width and the appropriate shape, the sponge bases are sealed allowing to dry for several days, initiating the bonding of the hundreds of scales that make up the sardine. Several cards will be inserted in the head and finish giving shape to the fish. A great work directed by the most veteran of the rock, that year after year, they make the sardines and they teach the young ones so that the tradition is not lost.